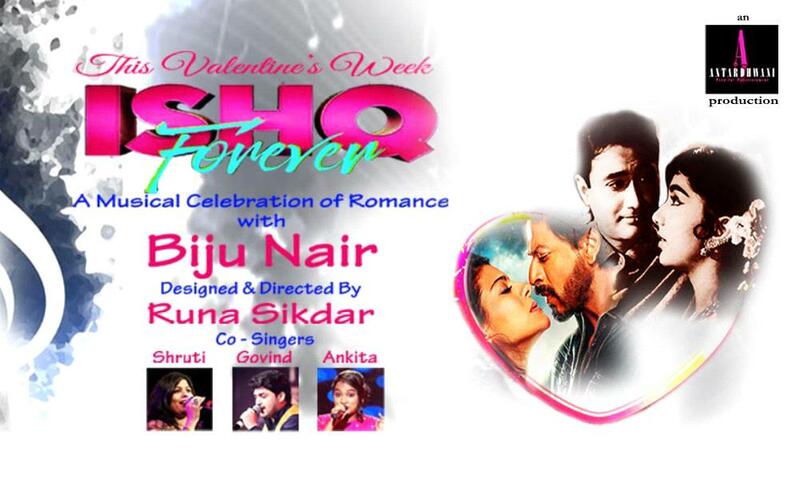 Ishq Forever-A Musical Celebration Of Romance will be held on Feb 17 at Chowdiah Memorial Hall. FEBRUARY Month approaching! The month is known for LOVE & ROMANCE! ANTARDHWANI- DESIGNER MUSICAL EVENTS is all set to make full use of the mood of the month! The next Mega Musical Event 'ISHQ FOREVER'- LOVE... THEN & NOW on SUNDAY, 17th FEBRUARY 2019, 6 PM Onwards at Chowdiah Memorial Hall, Bangalore. A Signature TRIBUTE to the Romantic Melodies from 50’s to 90’s with a beautiful bunch of Love Songs dedicated to The Eternal feeling of being in Love! The team of Reputed Singers has Sony TV Indian Idol Finalist and Sensational Singer Biju Nair at lead with three most talented singers of Bangalore, TV Reality Show Fame Shruti Bhide, Govind Kurnool & Ankita Kundu! The show is Designed & Directed by Renowned Designer Runa Sikdar. The most experienced & Popular Musician of Bangalore Pradeep Patkar will lead the music for the grand evening with his team!